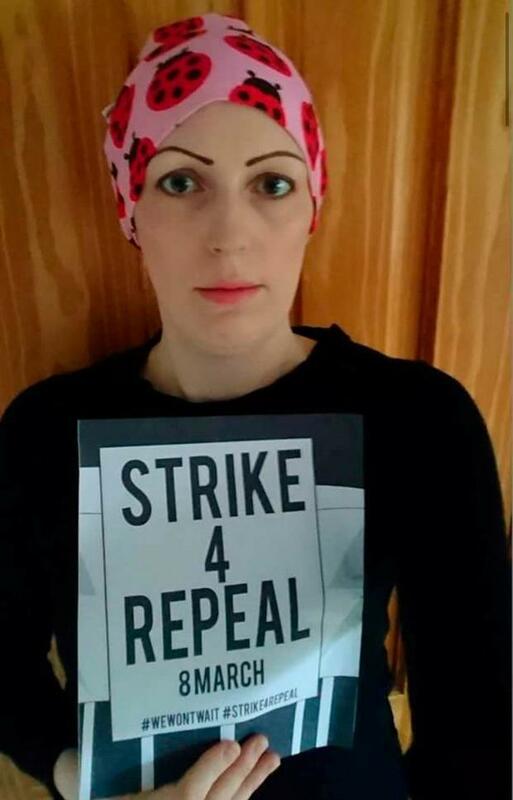 The husband of Irene Teap, who passed away after two false negative cervical checks, has posted a picture online of her posing for a Repeal the Eighth selfie before her death. Stephen Teap, of Carrigaline, Co Cork, said Irene, who died in July 2017, was at the end of a gruelling chemotherapy session when she had the picture taken. "As sick as she was, she got out of her bed, slapped on some make up, made her sign and took this selfie to show her support to all the other women of Ireland who were looking for change," he said. "This is just another example of the strong person Irene was. "Irene passed away before she ever had a chance to hear that we would as country have an opportunity to cast our vote on this very important topic." Mr Teap said he and Irene had spoken about the issue: "A woman's right to have full control and the final say on what happens to her body must most importantly be listened to and obeyed. "This vote is primarily about extending women's rights within our healthcare system. "I posted this for two reasons: firstly, to give Irene her voice in this referendum which was very important to her, and secondly for those that haven't made their minds up yet and are still on the fence on this to give them a different perspective to think about." The Undecided and the 8th: Are the Yes and No camps doing enough?